All-inclusive resorts in the Florida Keys offer choice accommodations with access to on-site amenities and a lot of other perks. For instance, they may provide nature walks, kids’ camps, games areas, fine dining and water-sports gear. Getting to one of its hotels is itself an exciting ride through scenic overwater bridges. The Upper Keys include Key Largo and Islamorada. They are a short drive from Miami and can make a perfect weekend destination for south Floridians. The Middle Keys include Marathon on Grass Key. It houses Sombrero Beach, a natural beach and has a nature center. Marathon has an airport, marinas, supermarket and businesses, serving as a hub for villages and tourists. The Lower Keys include Big Pine, Bahia Honda and Key West. Big Pine is known for its key deer, Bahia Honda is famous for camping, snorkeling, diving tours and kayak rentals. Key West is ideal for history enthusiasts and party seekers. All inclusive vacations come as attractive packages at high-class resorts in the Florida Keys. You can lounge on sandy beaches, get the best services and enjoy fabulous view from your rooms or villas. They offer an amazing opportunity to experience the entrancing beauty of nature amidst luxury amenities, such as massages, spas, hot pools and leisure activities. They provide the privacy and peace required for family vacations, and also cater to the needs of people who enjoy solitude. The packages are affordable, given the luxuries, amenities and activities included in each package. Activities include swimming, scuba-diving, sailing, kayaking and snorkeling. The equipment required for water activities are usually included in the package. 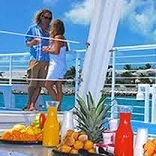 Boat tours and island excursions are also included. Packages also include breakfasts, lunches, dinners and beverages. Many agencies allow for customized packages with optional amenities. You can select from a variety of packages that cater to individuals, families, couples, and so on. Located 3 miles offshore in the Lower Keys, it can be accessed by boat or seaplane. It comprises secluded sea-view bungalows perfect for couples. It has 212 guest rooms and features an open layout with easy access to the beach. It has a fishing pier protruding into the Atlantic Ocean, allowing for unforgettable sunset walks. It is a 16-suite hotel located at an equal distance from Key West and Miami International Airport. It has 18 beachfront cottages spanning 18 acres of land. Each cottage has a kitchenette, dining area, living area and laundry. It has 87 beach houses overlooking the Gulf of Mexico. With well-furnished living areas, kitchens, dining areas and porches, these houses are excellent for families. It is a 150-room hotel featuring private balconies that overlook a natural beach. It has indoor and outdoor spas and a heated swimming pool. It has 11 cottages and features a beautiful manmade beach. It also has an orchid house and art gallery. It spans 60 acres of land on Duck Key and has guest rooms as well as villas. It also features resident dolphins. The large resort caters to families, groups and couples.